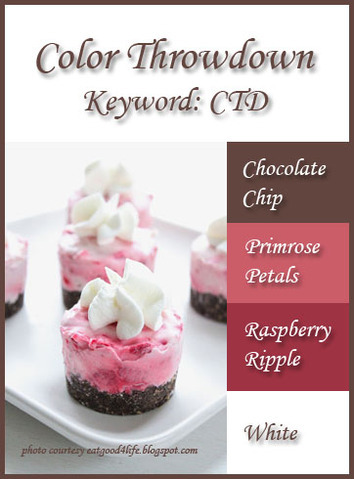 It's time for another Color Throwdown Challenge and Denise is making my mouth water with this yummy cheesecake inspiration photo! 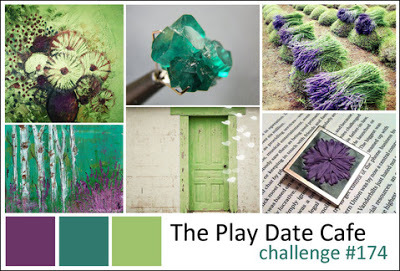 When I was brainstorming for this challenge, I simply could not get a Pinterest card photo out of my mind! So... I need to give credit to Jodi Collins for her card HERE that inspired my creation. 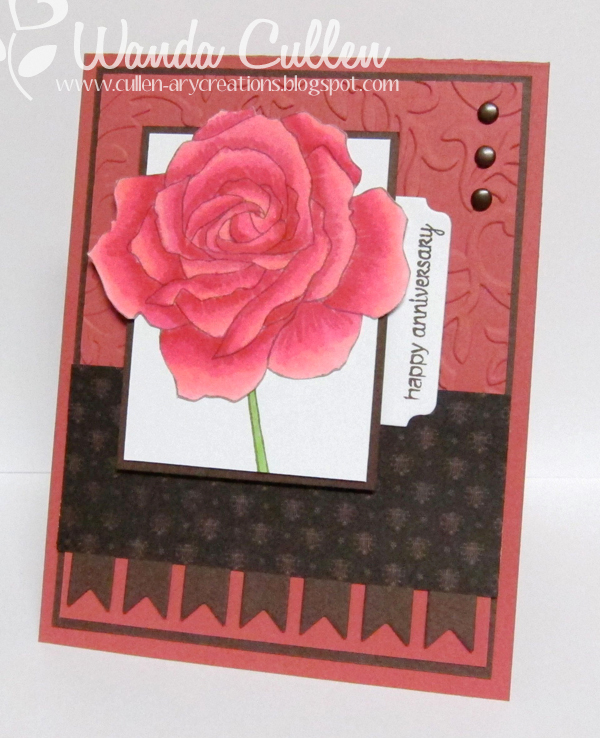 I stamped the rose image on X-Press It Blending Card using Memento Rich Cocoa ink then colored with Copics (RV23, RV25, RV29). The stem was stamped with Old Olive and filled in with G43. 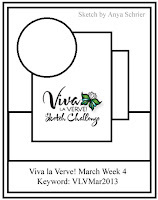 My layout is using the Week 4 Viva la Verve sketch by Anya. Remember, you don't have to use exact colors to play along...just something close. Be sure and label your project with CTD235 if you upload to a public gallery. You'll need to link up on the Color Throwdown blog as well. Can't wait to see what you create with these gorgeous colors! While you're there, be sure and check out the rest of the design team's creations...OR...you can visit their blogs below. 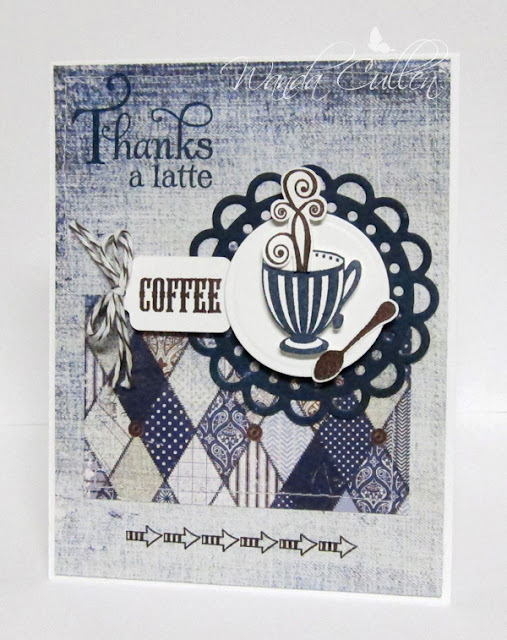 We've enjoyed having Kim as our guest designer this month - big THANKS to you, Kim, for sharing your creativity with us! Stay tuned to find out who our guestie will be for April! 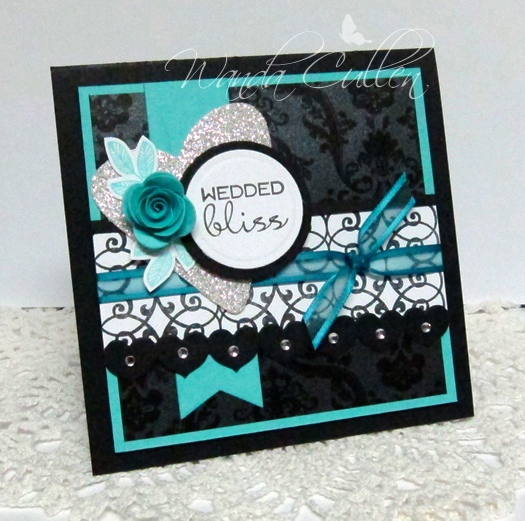 ACCESSORIES: Pennant trim die by Verve, Bracket die by MFT, Brads, Victoria EF, Copics. 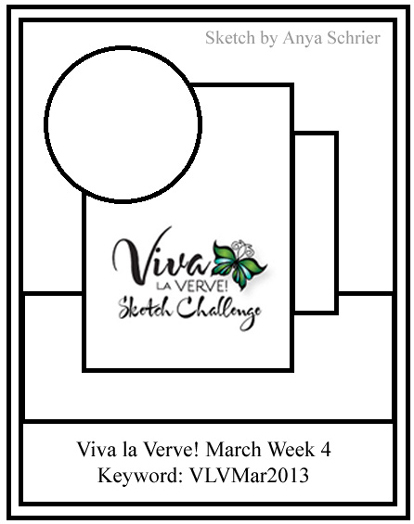 It's the last Monday of the month, so that means it's contest time with the Mojo Monday Challenge and you have a chance to win some new Verve! 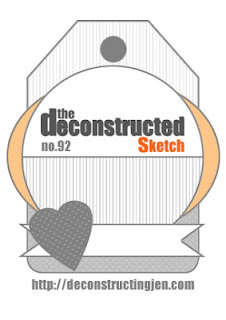 Julee has another great sketch for us - in circle or square versions - and I used it to create a wedding card for my nephew who is getting married this coming weekend! OR...you can swing by the Mojo Monday blog and check out the thumbnails! Thanks for stopping by...hope you find some time to play along with us! ACCESSORIES: Jotted heart die by Verve, Circle Nesties, Mini rolled rose Die-Namics by MFT, Polyester ribbon from Michael's, Heart border die by PTI, Rhinestones, Fishtail Flags Die-Namics by MFT. Another cold and wintry day with snow coming down fast and furiously while I'm coloring up a springtime Easter card! 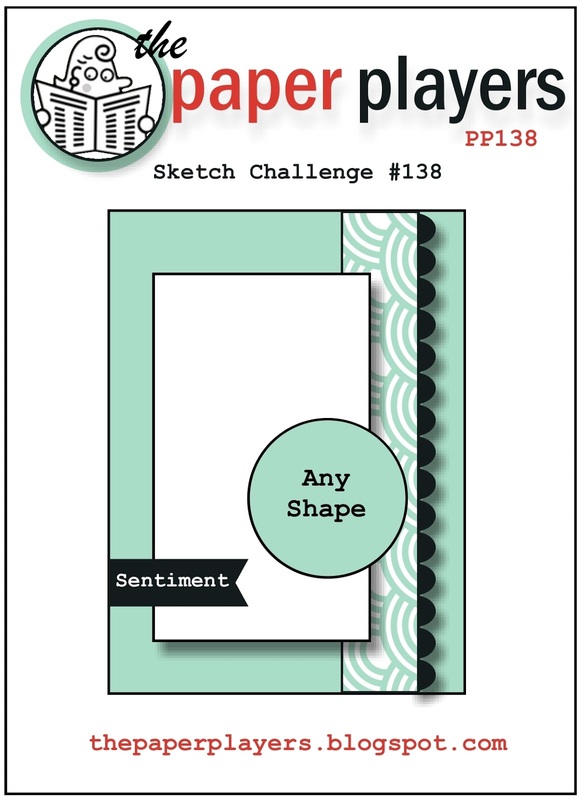 :-( I created this for the Play Date Cafe Challenge that uses these gorgeous colors and also for the Paper Players Challenge using this fun sketch by Anne Marie. I inked up this new Flourishes' image using Memento Tuxedo Black on X-Press It Blending Card then colored with Copics. The cream panel was embossed using a plaid patterned EF for some texture. Papers are from a mystery pad - lol! The cover is missing and I can't recall it's name. 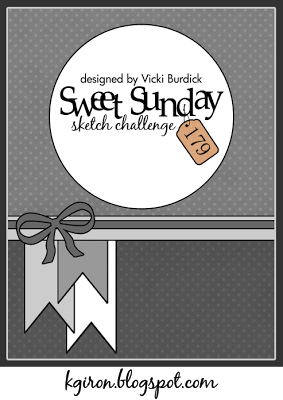 Korin has a great sketch posted this week for the SCS Sketch Challenge! I used more of the fun prints from Pebbles' "Family Ties" 6x6 pad and used SU's top note die for the base and a couple of MFT Fishtail Flags dies - highlighted with a hand-crocheted flower topped with a button. 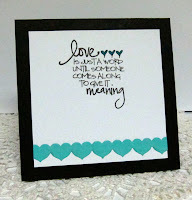 The sentiment is from Flourishes' Inside and Out Hello set - great for creating a multitude of sentiment combinations! A really quick and easy card to put together during a really busy week with working and having morning appointments prior to heading to work. Looking forward to a weekend off and a bit more stamping time! Have a blessed day everyone! 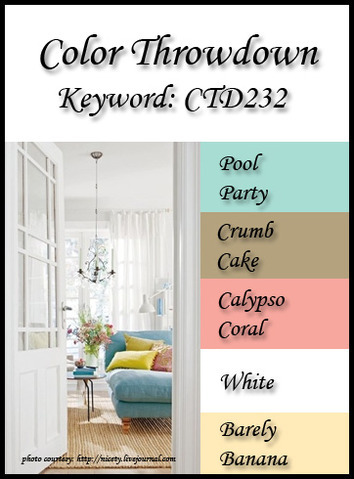 with these great colors picked out by Kerri this week! 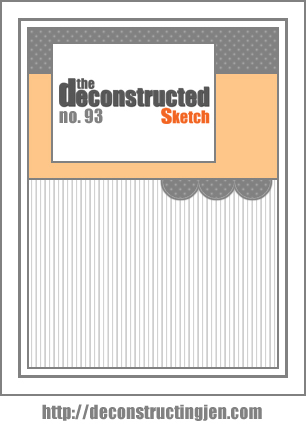 I started out using Jen Shults' Deconstructed Sketch for the layout and I'm hoping she won't gong me for taking some liberties with the design! I dropped the rectangular element to the lower part of the card and highlighted the sentiment (a great new one by Flourishes) with some of my fave rolled roses die cut out of Riding Hood Red CS. The leaves were cut using a Spellbinders' Foliage die then sponged with Garden Green ink. The DP "did most of the talking"...perfect to fill up the large empty space of the sketch! I sponged the heart using Crumb Cake ink and it was also a die cut called Tipsy Hearts by Sizzix. Remember, you don't have to use exact colors to play along...just something close. 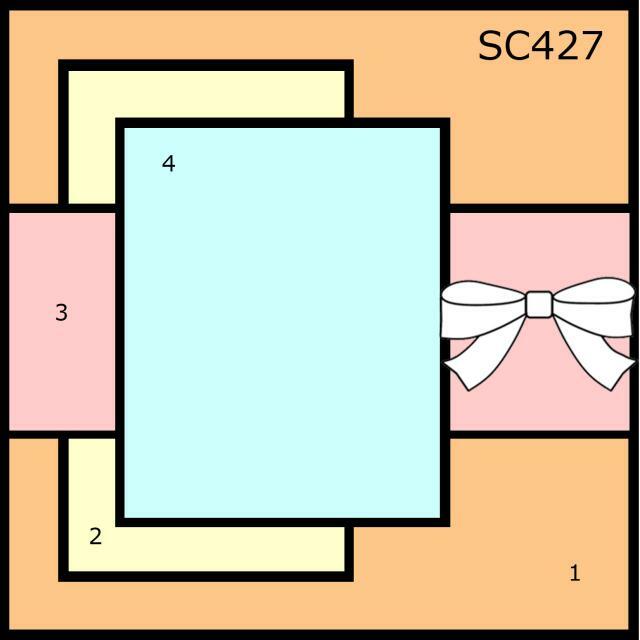 Be sure and label your project with CTD234 if you upload to a public gallery. 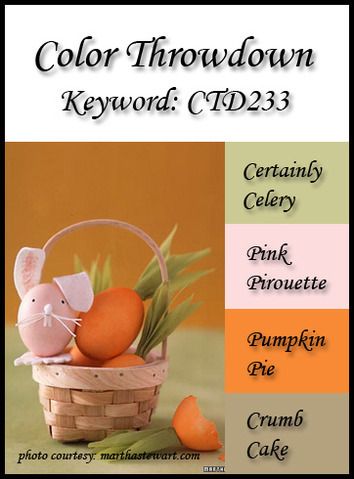 You'll need to link up on the Color Throwdown blog as well. Can't wait to see what you create with these gorgeous colors! While you're there, be sure and check out the rest of the design team's creations...OR...you can visit their blogs below. PAPER: Lost and Found Union Square 6x6 pad by MME, Vintage Cream, Riding Hood Red, Garden Green. 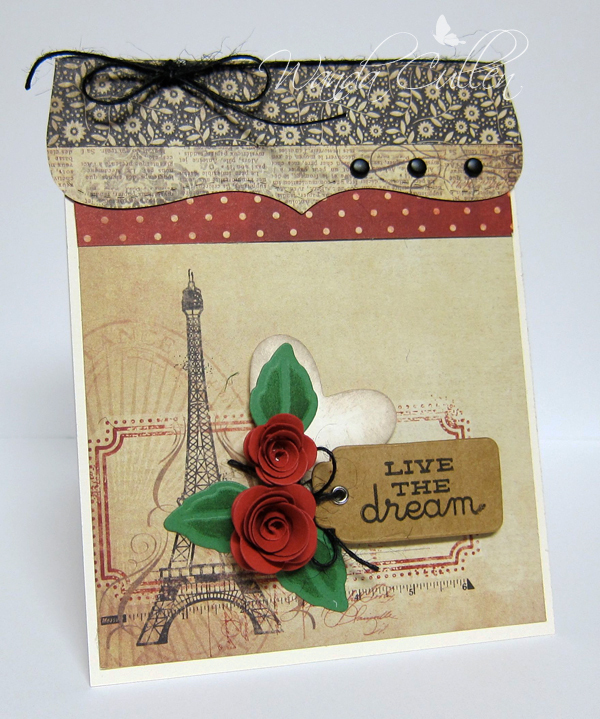 ACCESSORIES: Top note die by SU, Black jute twine, Brads, Mini rolled roses Die-Namics by MFT, Foliage die by SB, Kraft tag by Maya Road, Tipsy hearts die by Sizzix, Sponge. It's been awhile since I've played along with the Tuesday Trigger challenge, but this snowy and cold Monday was the perfect time to get cozy in my stamp room and get the creative mojo flowing! 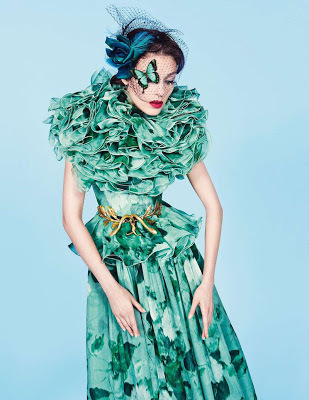 I was intrigued by these blue/green tones of color and also the gauzy, ruffly "feel" of the dress. I went with a CAS design...layering up some scalloped borders and embossing a BG using a Fancy Fan EF by SU which echo the scalloped border. 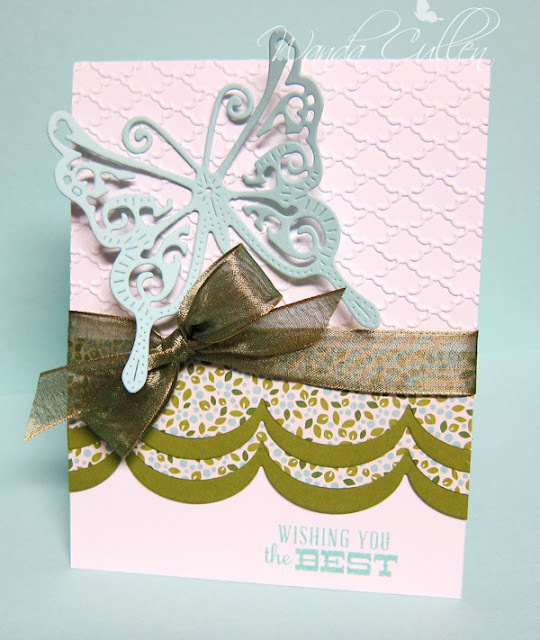 The sheer ribbon has a hint of shimmer and elegance and, of course, I just had to add a butterfly! I was amazed with all the gazillion shades of CS that I own that I didn't really have a good shade of emerald green which is the big color this year! Guess that's a big hint to all those paper companies! ACCESSORIES: Fancy Fan EF (SU), Butterfly die by Cheery Lynn Designs, Large scallop border Die-Namics by MFT, Metallic nylon ribbon (Michael's). Good Monday morning everyone! It's time for another Mojo Monday Challenge! I went with a flipped version of Julee's sketch, so I could use this Easter basket image and fill it with some yummy eggs! :-) Seriously...this month is FLYING by and Easter will be here before you know it! 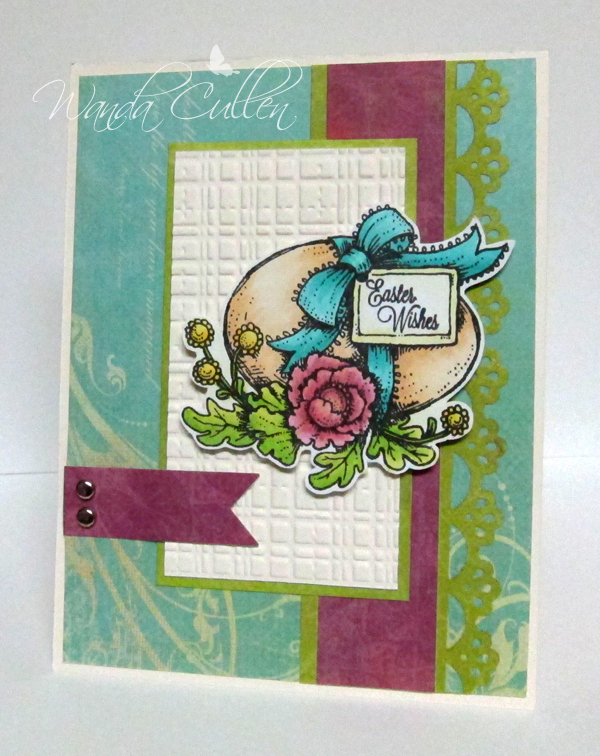 Papers are from Graphic 45's "Secret Garden" 6x6 pad - full of so many wonderful springtime colors! Stamps are from Verve's "Chicks Rule" and "Egg-stra Special" sets. 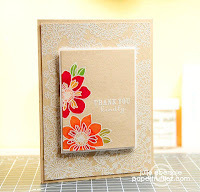 I used Verve's Flourished Trim die for the "stripes". 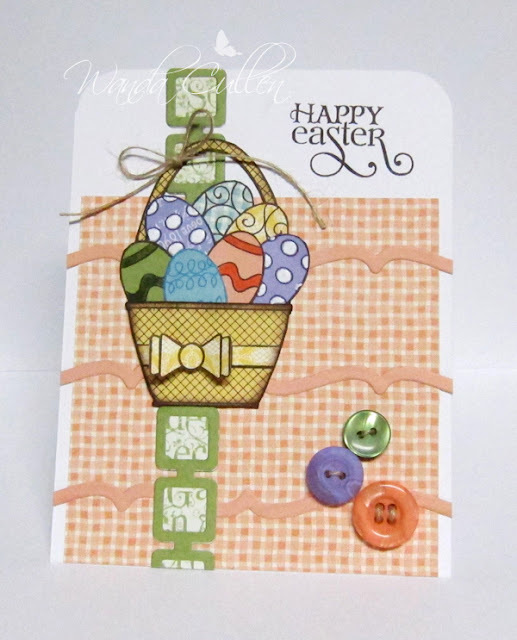 The green strip was layered using MFT's Retro Squares Die-Namics. The bow and ribbon band on the basket were paper-pieced with the bow stamped twice and popped up with a tiny foam circle. I'm playing along with a couple of challenges - both asking us to use green! Now, that's absolutely no problem for me since it's my favorite color! 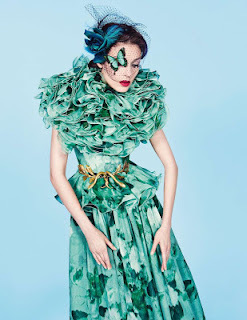 Flourishes Timeless Tuesday - Go green! ACCESSORIES: Victorian Oval Template dies (Flourishes), Labels Ten Nestie, Tiny Tags die by PTI, Ribbon - freebie from Ellen Hutson store, Lace by Flourishes. I-rish You A Happy Birthday! I had an unusual request from a coworker...to create a birthday card for her daugher who has a birthday on St. Patrick's Day! I computer-generated the sentiment using Chalkduster font and went with this sweet PI image from MFT...colored her with Copics, then fussy cut the image. I added some grass to "ground" the image and used the layout for this week's SCS Sketch Challenge. I covered the punched butterfly with fine glitter (which I can never photograph well). I'm hoping she'll be happy with the results! 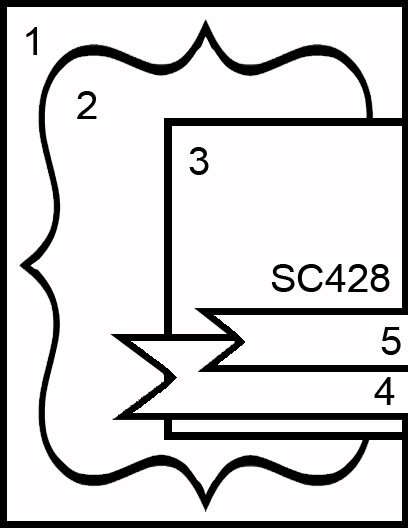 STAMPS: 4-Leaf Clover PI (MFT). 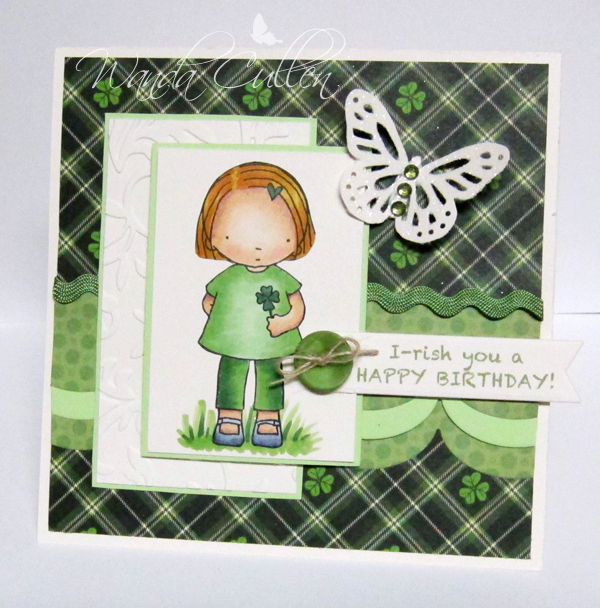 PAPER: Shamrock DP by Reminisce, Beach Ball DP by We R Memory Keepers, Vintage Cream (PTI), Gable Green (SU). COPICS: G40, G42, G46, C3, C6, YR23, YR24, YR27, E000, E21, E04, R20. Hello everyone! Hope you're enjoying some slightly warmer temps...I know I sure am! 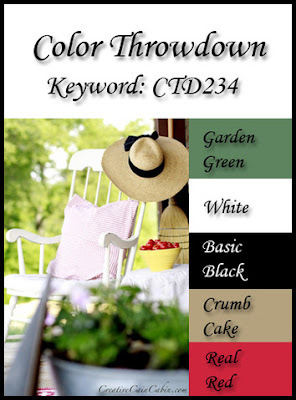 It's Wednesday, so that means it's time for another Color Throwdown Challenge and Lori has a fabulous combo for us this week! 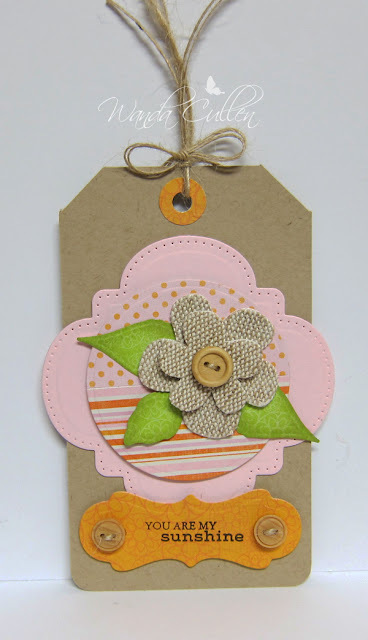 I also wanted to play along with Jen's Deconstructed Sketch Challenge, so created this layered tag using some new (to me) dies from Flourishes. 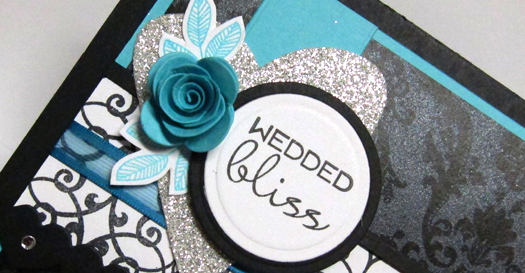 I just love the combination of embossing and piercing that these dies accomplish! The burlap flower is from Little Yellow Bicycle. Instead of the stark green felt leaves that came with it, I exchanged it with some Foliage die cut leaves by Spellbinders and sponged the edges with Certainly Celery ink. I also didn't care for the naked buttons, so added some jute twine. So, there you have it...a quick and simple tag! Remember, you don't have to use exact colors to play along...just something close. Be sure and label your project with CTD233 if you upload to a public gallery. You'll need to link up on the Color Throwdown blog as well. Can't wait to see what you create with these gorgeous colors! While you're there, be sure and check out the rest of the design team's creations...OR...you can visit their blogs below. ACCESSORIES: Classic Window Template dies by Flourishes, Circle Nesties, Foliage dies by SB, Naturals buttons by SU, Jute twine, 1/2" and 1/4" circle punches. It's been a whirlwind weekend and can't believe it's already Monday morning and time for another Mojo Monday Challenge! I spent two enjoyable days in Richmond with another RN...doing some retail therapy on Friday and then attending a really interesting brain injury workshop on Saturday. It's warmed up - thankfully - and much of the 18 inches of snow we got this past Wednesday has melted! Losing power for 12 hours that day was NOT FUN... especially when we don't have any backup system for heat! OK...enough rambling an on to my card! Isn't this a great sketch that Julee designed?! 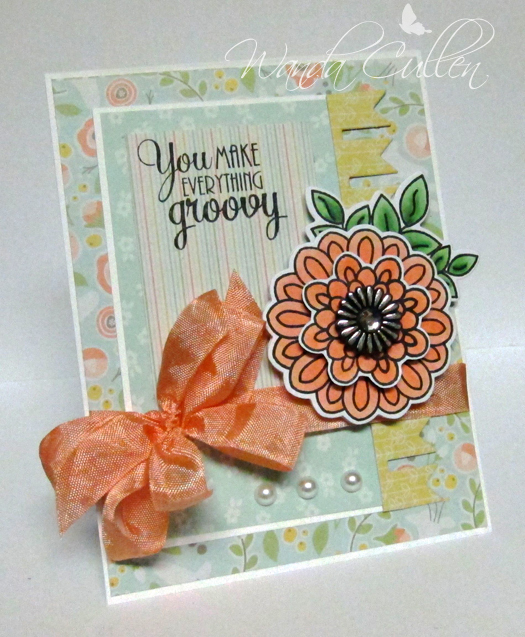 I decided to do a flipped version and layered this fun new flower from the "Surely Goodness" set. I also used some of the yummy seam binding from Verve's Spring Fling Collection. What else did I use? A decorative rhinestone sticker by Recollections...some adhesive pearls...Pennant trim die and coordinating Goodness Flowers die set by Verve. 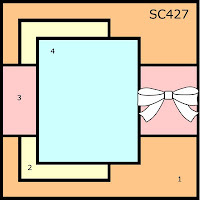 The image was colored with Copics (G40, G43, G46, YR01, YR02, R21). 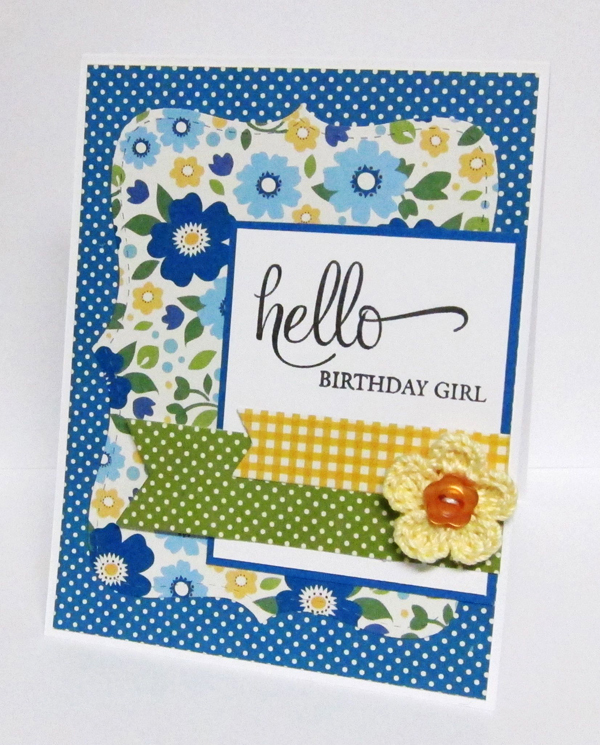 Designer papers are from the Simply Spring collection by We R Memory Keepers. So, here's hoping you will join us! For more inspiration, visit the other mojomakers' blogs listed below or you can go to the Mojo Monday blog. One of my fave weekly challenges is the CASE Study Challenge and with a new month, there is a new muse: the talented Julie Ebersole! 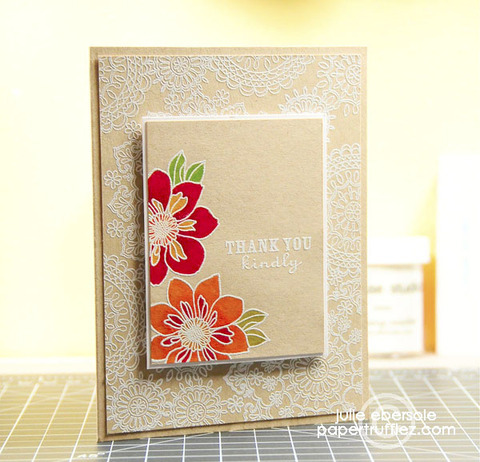 I loved the subtle BG stamping that Julie included on her base layer, (see her card on the right) so I stamped 3 different sized flowers in white on PTI's Soft Stone CS - LOVE this new (to me) neutral color! I colored the flowers and leaves with Copics (RV63, RV66, G40, G43, G46) and die cut them with Verve's coordinating dies. A rhinestone sticker by Recollections was adhered to the flower center after the layers were popped with foam dots. 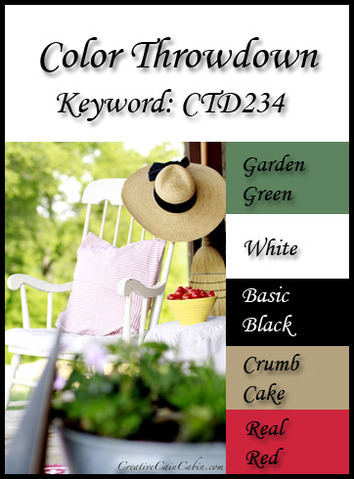 There might be snow outdoors, but this week's Color Throwdown Challenge is screaming SPRING with these great colors that Joan has chosen! I wanted to play with some new Verve stamps and dies. 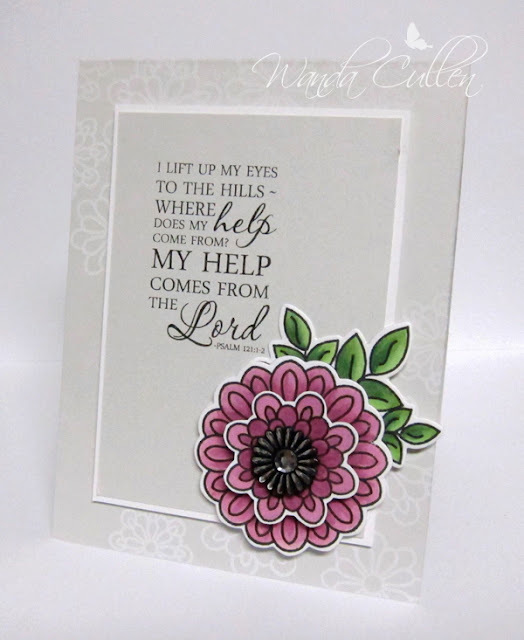 The flowers and banners were stamped then die cut and arranged to fit Karen Giron's Sweet Sunday Sketch Challenge. The burlap circle shape was layered over a kraft circle then layered over a Calypso Coral scallop circle. Various sizes of rhinestones were scattered across the stars and flowers to reflect the "keep shining" sentiment. Remember, you don't have to use exact colors to play along...just something close. 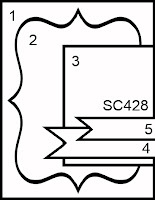 Be sure and label your project with CTD232 if you upload to a public gallery. You'll need to link up on the Color Throwdown blog as well. Can't wait to see what you create with these gorgeous colors! While you're there, be sure and check out the rest of the design team's creations. We're also very excited to welcome a new guest designer for the month of March: KIM HOWARD! Welcome, Kim! 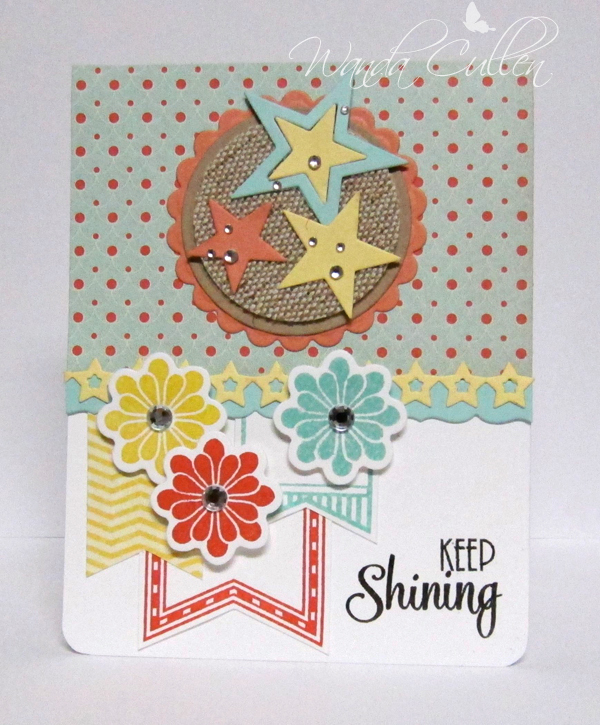 STAMPS: Shining Star (sentiment), Remember This (banners), Surely Goodness (flowers) - all by Verve. PAPER: Everyday Enchantment DP by SU, Lemon Tart, Calypso Coral, Pool Party, Kraft, White. INK: Daffodil Delight, Calypso Coral, Pool Party, Versafine Onyx Black. ACCESSORIES: Star border and Stars STAX Die-Namics by MFT, Goodness Flowers Die set by Verve, Corner chomper, Rhinestones, Burlap circle shape by Little Yellow Bicycle, Circle and Scallop circle Nesties. It's a new month, a new Monday and a new Mojo Monday Challenge! This week Carole is bringing us the sketch and it's a great one! I decided to bring out an older Verve set to pair up with some new (to me) Authentique papers. The different elements were popped up on foam squares to give it some dimension. My plan was to add Crystal Effects to the spoon but my ancient bottle simply would not "unclog", so will have to put that on my shopping list.